A Georgia stall in New Delhi. Coffee drinking has increased in metros as well as in tier II cities. Mumbai: Consumption of coffee is likely to rise by 6% this year because of better availability, driven by promotional activities of the state-run Coffee Board and a surge in out-of-home use, industry officials said. Consumption is rising in metros as well as in tier II cities and is being driven by growth of cafes and vending machines. “Cafes have made coffee more accessible to the masses," said Simran Sablok, general manager, marketing, Café Coffee Day, a division of India’s largest coffee conglomerate, Amalgamated Bean Coffee Trading Company Ltd. The specialist coffee shop chains are also now driving the coffee sales in non-South Indian regions, which are traditional tea consumption centres. South India accounts for more than three-fourths of the total coffee consumption in India annually. “We have our cafes in Shillong, Guwahati and Darjeeling in the east right up to Baroda and Rajkot in the west that are known for their tea drinking habits," Sablok said. The share of coffee consumption in restaurants and cafes is now 85% of the total out-of-home segment, according to the Coffee Board. However, per capita coffee consumption in India is only about 80g compared with 4.09kg in the US and 3.03kg in the UK and 3.41kg in Japan. 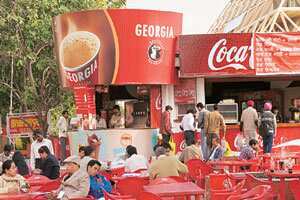 Per capita consumption of the caffeine beverage will only grow when overall consumption rises and coffee companies should work towards this, Duttagupta said.